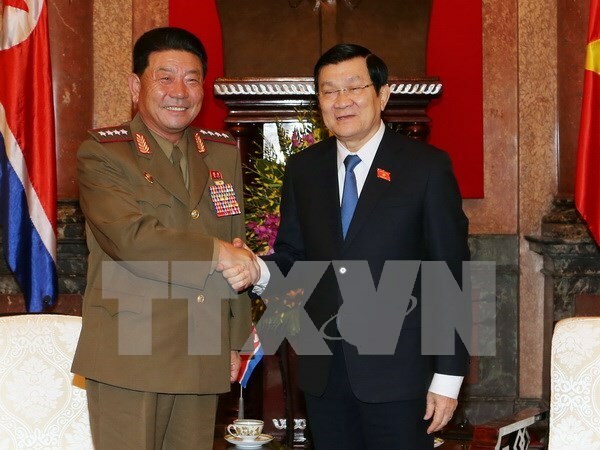 Hanoi (VNA) - Vietnam always treasures the traditional friendship with the Democratic People’s Republic of Korea (DPRK) and wants to enhance cooperation between the two countries, President Truong Tan Sang has affirmed to the DPRK’s defence leader. At his reception for visiting General Pak Yong Sik, Minister of People’s Armed Forces of the DPRK in Hanoi on November 27, the President shared the joy over the DPRK’s achievements in the past few years. He applauded the outcomes of the talks between General Pak Yong Sik and leaders of the Vietnamese Defence Ministry and urged the two ministries to carry out their commitments in an effective manner. For his part, General Park Yong Sik said he is happy with the sound relations between two countries, which were fostered by President Ho Chi Minh and President Kim Il Sung and many generations of leaders. The official also showed his impression of Vietnam’s achievements in socio-economy and security-defence, especially Party building work and the development of the military forces, as well as the prevention of the so-called “peaceful evolution” attempts by hostile forces.